When I announced to my family that I was going to make a healthy trifle for Christmas lunch this year that was gluten, dairy and refined sugar free it was like I had announced I was about to murder them. Seriously. Comments like, ‘Dan, please don’t do this to us!’ and “You can’t have a healthy trifle on Christmas Day!” ran rife! I told them not to be so silly and promised that it would taste better than my usual aeroplane jelly, packet jam sponge roll, tinned peach and custard creation that I had been making for years! Difficult to digest, I know. 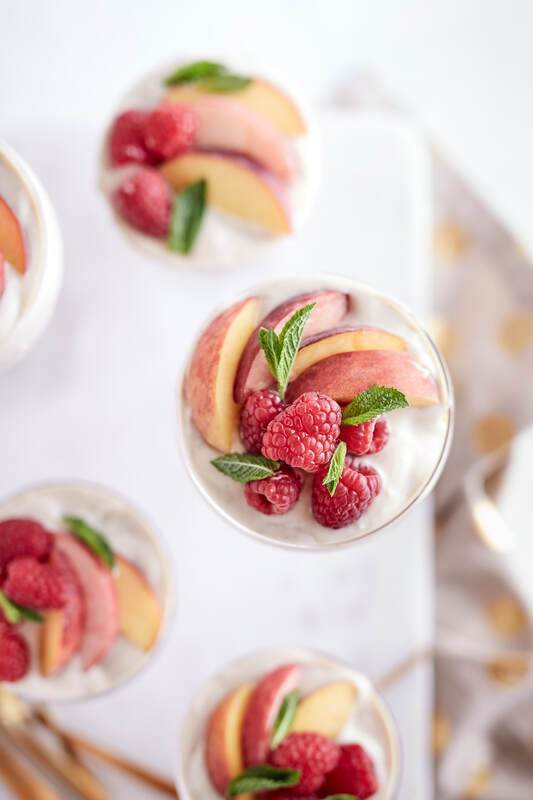 I do love a good challenge so set about thinking how can I make a trifle with all the hallmarks – custard, jelly, sponge – but without it being loaded with so much sugar and dairy that it gives you an instant tummy ache? Homemade jelly is actually pretty easy to make, it just requires some pure fruit juice or infused water and a little gelatine and instead of sugar, rice malt syrup does the trick. Next was custard, I still used eggs for this recipe but instead of cow’s milk and cream, opted for coconut milk which still gives a lovely thick and creamy result especially with real vanilla bean added. The sponge had to be light and fluffy so texturally the dish works and can soak up all the fruity flavours, so I worked from my grandma’s recipe which calls for white sugar, custard powder and corn flour and instead swapped it up with coconut sugar, desiccated coconut and almond meal. I was stoked with the result! It didn’t rise as high as Gran’s sponge but still a really good texture and if you made two batches and divided across two cake pans it would make a lovely celebration birthday cake if filled with raspberry chia jam and fluffy cream. 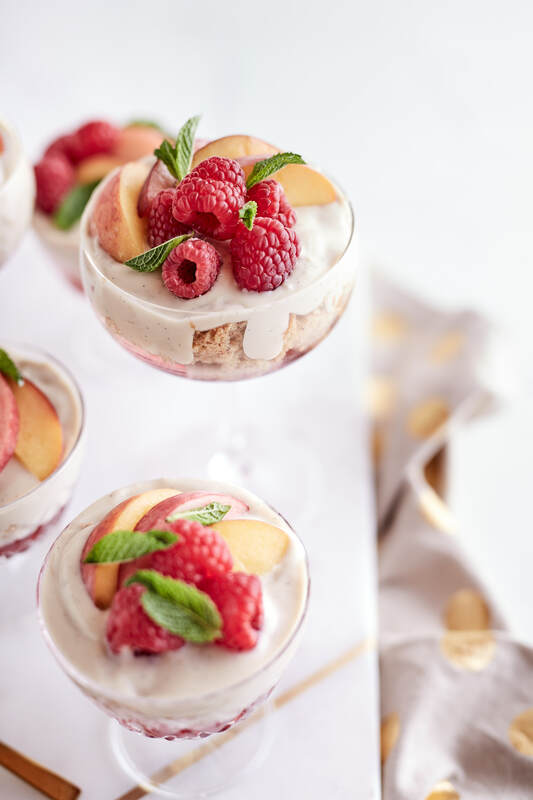 The hardest part for me was making the trifle look pretty in small glasses as I usually just make a trifle in a large bowl and throw it all together, which is what I plan to do for Christmas day. Excitingly I nailed it! My mum said it was “refreshing and yummy” and my dad who is the hardest to please when it comes to my healthy spin on traditional desserts also gave it the thumbs up! This is a really sweet and decadent way to celebrate Christmas that doesn’t leave you in a food coma afterwards. Let the turkey, pork, chicken, stuffing and gravy do that for you! 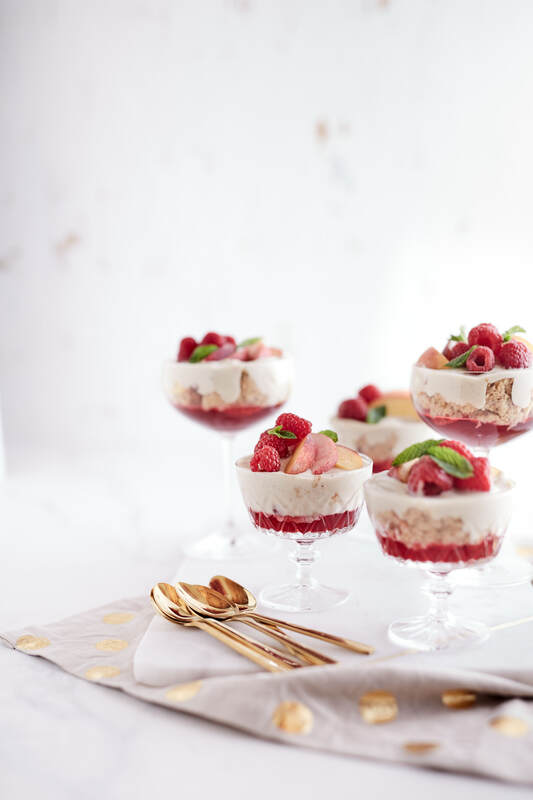 Optional – to make this a boozy trifle, add about 1/2 cup of sherry or coconut liquor like Malibu and drizzle over the sponge layer! Place raspberries and water in a small saucepan over low heat, allowing berries to soften. Bring mix to just below simmering point stir a little then turn off heat and allow raspberry juice to infuse for 30 minutes. Strain liquid, removing any raspberry pulp, then place in a mixing bowl and stir in rice malt syrup. Place gelatine leaves in a small bowl of iced cold water for 5 – 7 minutes to allow gelatine leaves to soften and “bloom”. Remove from water and squeeze out excess liquid from water then add gelatine leaves into the warm jelly mix and whisk well until gelatine completely dissolves. If the liquid is not warm enough the gelatine will not dissolve, if so pour the liquid back into a clean saucepan over low heat, do not allow liquid to come to a simmer or a boil, and stir until gelatine dissolves. Pour mixture into serving glasses or trifle bowl and set in fridge overnight or in freezer for approximately 45 minutes. To make custard place coconut milk, maple or rice malt syrup and vanilla beans in saucepan over low heat, stir well to combine and heat up until just below simmering point. Whisk egg yolks and flour together in mixing bowl, when coconut milk mixture is hot, add a little to egg yolks then whisk, then add remaining coconut milk mixture, whisk together well, then put mixture back into saucepan over low heat and stir with flexible spatula for about 5 mins until mixture is thickened and flour has cooked out. Turn off heat and set aside in clean mixing bowl. Place cling wrap directly on top of custard to avoid custard forming a skin, place in fridge to chill completely. Preheat oven to 180 degrees. Line a 20cm cake tin with baking paper. Separate eggs, place whites in a clean electric mixing bowl and beat until soft peaks form on medium – high speed, then add sugar and whisk until medium – firm peaks form and sugar has dissolved. Remove from electric mixer and add in egg yolks, coconut, almond meal, cream of tartar and baking powder and using a large spoon fold the mix gently until fully combined. Add to cake pan and bake for about 20 – 25 minutes, or until lightly golden and cake springs back when touched. Remove from pan and allow cake to cool for 5 minutes before removing gently and placing on cake rack to cool. Allow cake to cool before assembling trifle then gently pull cake apart into bite-sized pieces. 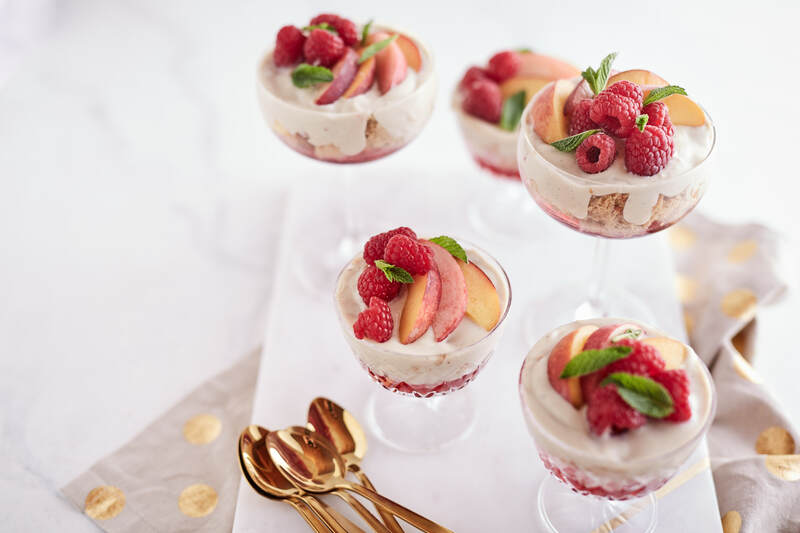 To assemble trifle, place a layer of sponge cake on top of jelly, drizzle over sherry or coconut liquor (if using), top with half the amount of sliced peaches and raspberries, cover in coconut custard then top with extra fresh fruit and mint leaves. Place in the fridge to serve! When using gelatine leaves, always refer to packet instructions for best results to set a jelly like liquid, you will need enough leaves to set 500mls of liquid. Powdered gelatine is also OK to use.